Search engine optimization for any business can be tricky to implement correctly, let alone home builders. Most home builders I talk to have either hired an SEO company or are currently working with one because they don’t have the knowledge in-house. However, there are some very critical elements that, if learned, can be implemented in house and will make a huge difference in your ability to get found by home buyers in your area. Many SEO companies want you to think you can’t do what they do. Now, there are certainly some nuances of SEO that are complex and will get you the best results, but if you can learn just some of the best practices in the SEO world, you’ll be better off than most of your competitors. I like to think of it as the 80/20 rule. Learn the critical 20% and you’ll get 80% of the performance out of your SEO strategy. So, let’s talk about on-page search engine optimization for a minute. On-page search engine optimization is the practice of “optimizing” each page on your website. By changing a few key elements on each one of your pages, you’ll have a much better chance at ranking for your target keywords. Here are the elements. The blue links are the Page Titles that each of those websites has selected. Google reads the Page Title (along with the other elements below) to try to determine what this page is about. The more relevant your Page Title to your home buyer’s search, the better chance you’ll have of getting found. Basically, we want to help Google identify what is on our website so that they can help searchers find the correct information. And of course, we want to help Google connect home buyers with our website instead of our competition. The header or H1 tag on a page is simply that: the header on a page. It’s another key indicator that Google looks at to try to identify what a page is all about. Commonly, I’ll see home builders use their community name as the header for a page. It’s good to mention the community name. This allows searchers that may have driven by the community to find it. However, it doesn’t allow searchers that don’t know about this community find it because they will be using more generic search terms like “available homes in Denver” or “new homes in Denver”. A better header would match the URL and the Page Title, and it would include a location as well. In this case, “Available New Homes at Community Name in Denver, CO” is a better header because it describes what is on the page and also where the homes are available. When you take a picture with your camera or smart phone, it typically gets assigned a random file name such as DSC007.jpeg or photo1.jpeg. When you upload that picture to your website, that is really the only way Google can read this image. It can’t look at the image and determine it is about “Available Homes”, so you need to re-name your image files before you upload them. If we use the example from above, if you were including an image on the page, you’d want to name the image file “available-new-homes-in-denver-co”. By naming your image something descriptive, you help Google identify what is in the picture and give yourself a better chance at ranking for something relevant (i.e. Available New Homes in Denver, CO) as opposed to “photo1”. The body text, or text on your page, should also include your keyword phrase. However, don’t get carried away here. The goal isn’t to “stuff” your keyword into the body text multiple times just for the sake of it. Also, if it just doesn’t seem to fit naturally into the body text, I’d recommend not using the exact phrase. Maybe it just sounds a bit awkward to say “Available New Homes in Denver” in your sentence. Just opt for something close, but normal sounding like: “Here you’ll find many available new homes located in and around Denver”. The final on-page element you want to be aware of is the Meta Description. The Meta Description is the text that shows up in a Google search and sits below the blue link and the URL. See the image below. Your Meta Description should be catchy as well as contain your keyword or some variation of your keyword. The goal is to get the searcher to click on your listing. If you’ve done a good job of including your keyword phrase in each of the core on page SEO elements, you’ll be in great position to start moving up and ranking for that keyword. Now that we’ve covered how to optimize a website page, the big question you’re probably asking is: “How do I select the right keyword for each page on my website?” I could spend a lot of time writing about keyword research, but the purpose of this article is to show you how to structure your SEO for New Home Communities, so I’ll just do a brief overview here. The first step to optimizing a page on your website really starts with the research phase. You want to see what keywords your prospects are searching for, which keywords you are ranking for, and which keywords you want to be ranking for. It’s also helpful to know what your competitors are ranking for. Find 200-300 initial keywords as a part of my brainstorming efforts. Identify what the estimated search volume is for each keyword. Identify how hard it will be to rank for each keyword. Once I’ve found the low hanging fruit, I’ll have a good sense of which keywords I want to use to optimize my new home communities for (as well as other core pages on my website like the Home page or About us page). Okay, let’s get to it. 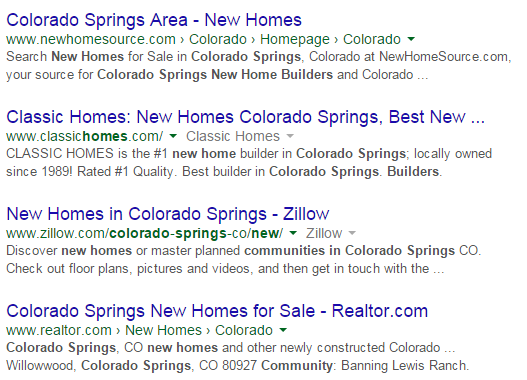 How should you structure your SEO for your new home communities? Most new home builders don’t optimize at all for their community pages which is a big time missed opportunity. Typically, you’ll have anywhere from 3 – 50 communities depending on the size of home builder you are. Each community has a unique name and a page that has information about that community as well as listings and floor plans. That covers the basics on the main community page, but we also need to tackle the floor plans and current listings. Typically, listings and floor plans do NOT get optimized by home builders. Sometimes this is due to the limitation of the content management system you are on. There is some missed ranking opportunity here again! You should be seeing a similar trend now. The floor plan pages are optimized for the name of the floor plan, but not a generic term that someone might be looking for such as “new home floor plans in Denver, CO”. To better optimize floor plans pages, I would do something like this below. In addition, I’d want to do the same thing for all my current listings. Want a cheat sheet to get your started? We’ve created a Sample SEO Plan exclusively for Home Builders. Social Media Marketing Consultant – Does Your Guy Do This?